Three year olds gain more self-esteem and need more opportunities to be independent. Our program focuses on exploration, discovery, and teacher directed lessons, hands on learning, and center based free play. 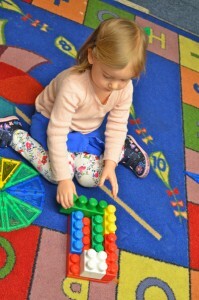 The three year olds work on early mathematical concepts, alphabet knowledge, emerging literacy and creative arts. We use a thematic approach to learning all academic subjects while celebrating holidays and seasons. Our teachers work diligently on increasing social interaction, encouraging curiosity, and enhancing problem solving skills. This transitional program into pre-k focuses on social, emotional, physical, cognitive, and language growth by providing opportunities for children to engage in center play, outdoor play, daily art projects, calendar time, and story time. There is an introduction to simple homework and weekly newsletters for teacher-parent communication. This process continues the learning at home between teacher, parent and child. Special event performances by the children happen twice a year for parents’ enjoyment and to share what the children have been engaging in throughout the school year. 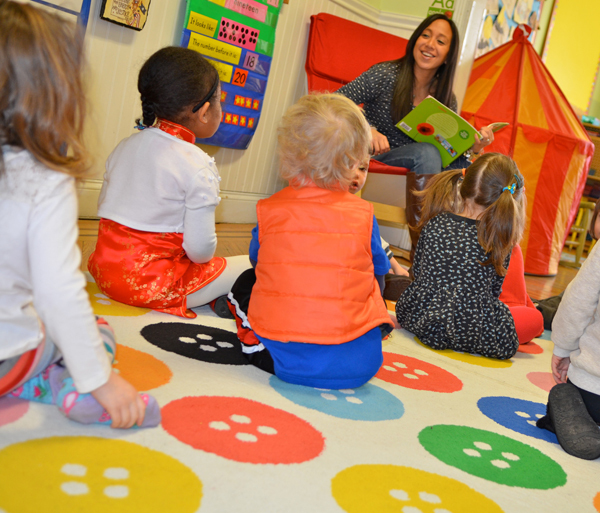 The three year olds embrace their safe learning environment under the care and supervision of a dedicated staff. 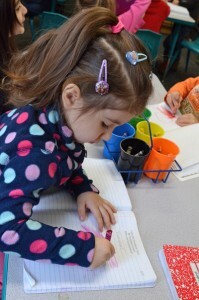 Our teachers show compassion and consideration to each child as they prepare them for preschool. Greet each child with a new song per week, introduce the day of the week, the month of the year, the year, and the weather through music and dance. Introduce the letter and number of the week. A balance of individual and small group in the centers set up in the classroom. One teacher directed activity at this time will be set up for the children to participate. Outdoor Playtime A balance of individual and group play opportunities in the outdoor play yard. Read a short story, poem, or nursery rhyme followed by illustrating a picture and answering a question in their reading journals. Daily Care involves washing hands, using the potty, cleaning up and prepare for lunch or snack time. Each child will be encouraged to sit at the table to eat with their friends. Lunches will be heated as needed and the children will begin to foster independence at meal time while the teacher models good eating habits. Children will be taught a simple math lessons in their journals. Full day children will have their diapers changed or asked to use the potty. Then they will be put down to nap while listening to classical lullaby music. Children will put their heads down and listen to classical lullaby music and they rest up for the afternoon activities. The children will engage in large group teacher directed movement activities; sometimes accompanied by music. Review letter and number of the week through music, dance, or literature. One teacher directed activity at this time will be set up for the children to participate. Snack Time The children will enjoy a small snack and beverage with their friends. Outdoor Time A balance of individual and group play opportunities in the outdoor play yard. The children will engage in different activities per day: Monday (Yoga), Tuesday (Science), Wednesday (No Bake Cooking), Thursday (Drama) Friday (Music/Art History). Review of the day’s activities, talk about what will happen tomorrow, and prepare the children for departure.